Author Bonnie Gaunt states the crest of the Inner Bank had a 316.8 feet diameter which is significant and very important concerning the geometric harmony of the whole design, the crest marks the mean diameter which is the same as the mean circumference of the Sarsen Circle and a 316.8 feet perimeter square fits tangent around the Bluestone Circle. Author professor Raymond Capt said the Inner Bank was once at least 6 feet high and that the Outer Bank now almost worn away had a diameter of some 380 feet and was once about 2 feet high, geometric design analysis shows the Inner Bank was 6.336 feet high, the Outer Bank had a 380.16 feet diameter and was 1.9008 feet high (1.9008 feet x 100 = the radius). If the Inner Bank was at least 6 feet high the nearest height to this with any meaning is 6.336 feet and to calculate the width of the base all we need is the slope angle, fortunately the only real canidate is tan 0.44 which is the diagonal angle of the Station Stone Rectangle and using this angle also led to revealing the original width, height and depth of the Ditch and Outer Bank as you can see for yourself below. Note that below and on the following page the Outer Bank, the Ditch and the Inner Bank are shown on a larger scale than their diameters so that details can be seen better or we could say the diameters have been shortened to fit on the page, this has no affect on the geometric calculations. 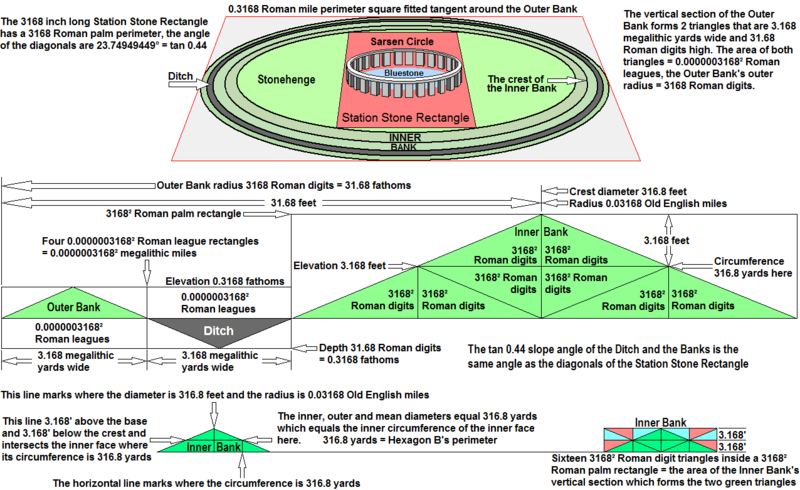 Using the number 3456 to demonstrate another layer of design harmony and confirm we have the exact dimensions of the original design, the Sarsen Circle’s outer circumference is 345.6 Roman feet, the Inner Bank is 345.6 inches wide, it’s inner diameter = 3456 inches, it’s outer diameter is 345.6 feet, 34.56 x 345.6 inches = the mean circumference and the area covered by its base is the product of 345.6 inches x 345.6 inches x 345.6. The inner face is an analogue of a cube with a 3.456 acre surface area (Cube B). Adding 34.56 feet to the Inner Bank’s 345.6 feet outer diameter produces the Outer Bank’s outer diameter and it’s circumference is the product of 34.56 x 34.56 feet. All circles encountered in this investigation that have circumferences of 3456 units or 34.56 units etc. are significant i.e. concerning their 1/3 sectors. The 3168 signature is placed on many units of linear measure and the area measures called the acre and the rood this is a common theme of the Great Pyramid’s full design, the design of Silbury Hill, cosmic design and simple geometric factors of the units themselves.